A walk in the Lewes Road Cemeteries brings back the past and much of the history of Brighton, in a way that few other places can. The Victorian burial grounds, set in 42 acres, are one of the most beautiful spots in Brighton - many of the notable monuments may be found by following a circular waymarked trail. A free Walker's Guide leaflet is available. The cemeteries are also a haven for a huge variety of wildlife, with trees, woodland and meadows, which are carefully maintained and managed to encourage wildlife to thrive in an urban environment. 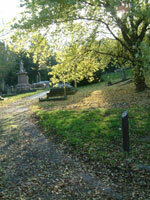 The trail starts in the Extra-Mural Cemetery, Lewes Road, Brighton, BN2 3QB. Please be aware that the pathways are steep in places. Toilets are available at the Woodvale Chapels. Dogs are not permitted in the cemeteries. The grounds are open 365 days a year. If you require further information please contact Bereavement Services or would like to learn more about the wildlife which thrives in Brighton & Hove then contact the Countryside Service.